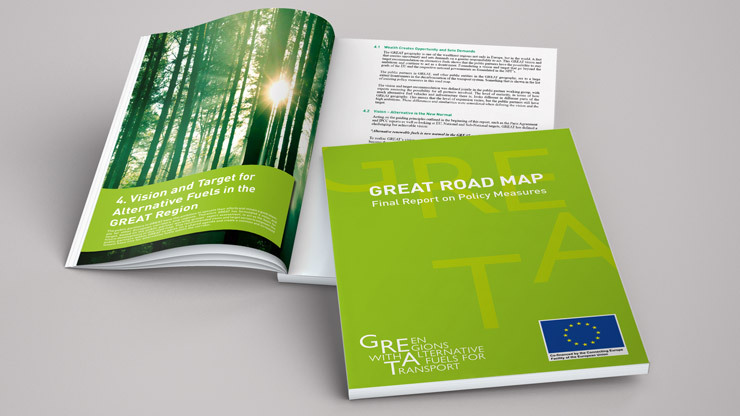 The GREAT Road Map report on Policy measures is now available. The report looks into and propose long term policy development to enable the transition to alternative fuels on a local, regional and national level. The work in Activity 5, Policy Measures, has been led by the Capital Region of Denmark and the Road Map report is made in cooperation with the public partners with input from the private partners. Transport has contributed considerably to economic prosperity over the last century. Highly dependent on fossil fuels, transport is also a big factor in both climate change and deteriorated public health. The EU supports the deployment of an alternative fuels transport system that works seamlessly across borders. GREAT is an EU funded project in the Scandinavian-Mediterranean Corridor. A unique combination of public authorities and private companies working together to deploy infrastructure for e- and g-mobility between Hamburg and Oslo/Stockholm. The public partners of GREAT are frontrunners in the decarbonisation of the transport system and a good example for other European corridors and regions. The purpose of this road map is to look into and propose long term policy development to enable the transition to alternative fuels. The public partners have conducted a thorough evaluation of their current policy measures to define best practices and policy measures, proved to have high impact on the implementation of alternative fuels. The measures are divided into innovation domains: Infrastructure Adaptation, Regulations, Taxes & Subsidies, Knowledge sharing & Pilot projects and Procurement. The evaluated measures are combined with the vision in the road map model. It develops a best practice and shows how policy measures could evolve in 2020, 2025 and 2030, from the perspective of the public partners. This provides the public partners and other public entities, both inside and outside the GREAT geography, with tools and guidelines to align the efforts of different countries, make progress in harmonising policies and developments and influence national policies. Conclusions are that the public partners, regions and municipalities, have shown to have more ambitious visions and targets than those of their nations. The partners have been innovative and should continue to be innovative. In the areas of Infrastructure Adaptation, Regulations, Knowledge Sharing & Pilot projects, and Procurement, the public partners have the ability to take action and drive progress directly. Furthermore, they have the capability of becoming role models within the areas of Procurement and Knowledge Sharing & Pilot Projects. GREAT as well as this road map is a testament that alignment and cooperation often lead to the best results. All of the innovation domains present opportunities for the partners to work together, involve the relevant actors in the corridor and get them to commit to the vision and take responsibility for measures within their field. In particular, achieving results in the Taxes & Subsidies domain – and ensuring that nations work in a coordinated way – will require the partners to cooperate to influence national governments.